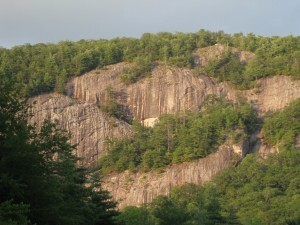 An undercurrent of excitement is running through the town of Cashiers in anticipation of the debut of The Cashiers Mountain Music Festival on July 4, 2009. Developed by the dedicated team at the Cashiers Area Chamber of Commerce, this inaugural Independence Day event will be hosted at the Village Green and will benefit local area Youth Musical Education. Recently named as Festival Director, Mark Wise a local resident and veteran entertainment producer has long dreamed of a world-class music festival in Cashiers. Wise has produced shows for Walt Disney World Entertainment and Universal Studios Florida, and understands the careful planning required for such a special event. The festival will include performances by The Isaacs with their eclectic blend of bluegrass, gospel and country music and will culminate in a breathtaking fireworks display. Additional performers will be announced at a later date. Event parking and admission for children five and under will be free. Children aged 6 -12 will be admitted for $5, and general admission for adults will be $20. Mark your calendars and plan to join your neighbors for a great day that promises music and fun for the whole family! Some things are well worth the wait! After more than a year and a half and an estimated $6 million in renovation costs Gorges State Park reopens its gates to the North Carolina public. Situated on 7,520 pristine acres in the Sapphire/Lake Toxaway region of the Highlands-Cashiers Plateau, Gorges is the only state park found west of Asheville. The newest additions to the park include 350 new parking spaces in four parking lots; four miles of paved roads; new trailheads and trails; and improvements to the parks infrastructure including water, electricity and phone lines. And thats just the beginning! Construction of the next phase in the transformation of Gorges State Park is slated for the winter of 2010. Plans include a visitor center and two sheltered picnic areas, as well as new restroom facilities and a maintenance area. Gorges State Park now features six hiking trails anywhere from one to over 14 miles in length for a total trail system of 28 moderate to strenuous miles. Horses and mountain bikes are allowed on the 14 mile Auger Hole trail, and campers are welcome to pitch their tents on one of six campsites along the nearly 7 mile Foothills trail. Nature lovers will appreciate the fact that close to 125 rare plant and animal species native to the Western North Carolina mountain region can be found within the park, 12 of which are either threatened or endangered. The park is currently open from 8 a.m. to 8 p.m. Visitors should be mindful of the fact that the gates are secured at closing. To access the park from Cashiers, travel east on Highway 64 to Highway 281. Travel approximately 7 miles south on 281 to the entrance of Gorges State Park. Upper Bearwallow Falls, the Bearwallow Falls Overlook and a new picnic area are scheduled to open on Monday, May 18. The Gorges Overlook is lined up to open on Monday, May 25. March May 8 a.m. 8 p.m. June August 8 a.m. 9 p.m. September October 8 a.m. 8 p.m. November February8 a.m. 6 p.m.
Talking Turkey May 16 at 2 p.m. Box Turtles and Timber RattlersMay 17 at 2 p.m. Trailhead and Trailside WildflowersMay 20 at 9 a.m.
For more information about these and future programs, call the Gorges office at (828) 966-9099. The rainy days of April have made the ground a perfect medium for a colorful palette of May flowers. As visitors descend upon the Highlands-Cashiers Plateau in the coming weeks, its a given that many either wont want to leave at all or will choose to buy a vacation home here and return year-after-year. At Silver Creek Real Estate Group, its both our job and our passion to find a perfect match between buyer and seller, and help turn dreams into reality. In this article, we will focus on the exterior of the home what the buyer will see when they first arrive at their potential new residence. Keep in mind, you never get a second chance to make a first impression! Weve compiled a few easy, economical steps you can take to increase the curb appeal of your home making it simpler for buyers to envision themselves living within the four walls behind that pretty picture youve created. Not planning to go anywhere anytime soon? The tips below are still great ways to beautify the exterior of your home. 1. According to the experts at HGTV, the first thing you should do is look at your home from the buyers perspective. Take a big step back so you can see the front of your home completely. Pay particular attention to what draws your eye the good and the bad. Oftentimes, its your front door. Does it look appealing? Does it say Come on in!? If not, a tasteful wreath may do the trick, you may want to paint your door a new color or it may be worth investing in a beautiful new door. At times, a bench and some pretty potted flowers might augment the front of your home giving the feel of an outdoor foyer. At the very least, consider putting out an attractive new doormat that says (figuratively or literally) Welcome. 2. Develop a landscape plan. If your thumb is not particularly green, you may want to consult with a landscape expert. You may be able to find one through friends or even through the phone book (or call Silver Creek, and well point you in the right direction). Ask their price to develop a landscape concept for you BEFORE you have them come out to the house. Once you are happy with their estimate, invite them to create a plan for you. If you feel comfortable going it alone, the advice at your local nursery is FREE. Find out which plants and flowers will work best based on the amount of sun or shade your yard receives, and which will have the most impact. Be sure to check out the Tailgate Farmers Market at the Cashiers Community Center on Wednesdays (1 p.m. to 6 p.m.) and Saturdays (8 a.m. to 1 p.m.) throughout the summer and support local growers. 3. Pay attention to details. Beyond the front door and the landscaping, you should concentrate on even the minutest elements of the front of your home. Remember, the point is to get the buyer from the car to the interior of your home. Are your windows clean (would window boxes add a nice touch)? When was the last time you power washed your driveway (if you have one)? Hows the paint holding up trim and siding? Does everything look neat and tidy? Sometimes, something as simple as a clean, crisp edge to your lawn and landscaping can speak volumes to a potential buyer. Still not sure how to get started? As a full-service brokerage firm, we are more than happy to help you figure out the very best ways to position yourself in the market, as well as stage your home from inside to outside to expedite the sale of your property. To set an appointment for a walk-through by one of Silver Creeks talented brokers, contact us at jlucke@ncliving.com or by phone at (828) 743-1999. Happy Planting! June thru October On the Verandahs Dugout Spirits & Wine Bar presents Movie Night the 3rd Tuesday of the month beginning at 7:30 p.m. Test your trivia knowledge with classic cinema lines you know by heart, and compete for prizes. On the Veranda celebrating its 29th season is one of Highlands most unique and scenic dining venues, overlooking beautiful Lake Sequoyah. For more information, call 828.526.2338 or visit their website at www.ontheveranda.com. June thru October On the Verandahs Dugout Spirits & Wine Bar presents Trivia Night the 2nd Wednesday of the month beginning at 7:30 p.m. Compete for the championship and win prizes. On the Veranda celebrating its 29th season is one of Highlands most unique and scenic dining venues, overlooking beautiful Lake Sequoyah. For more information, call 828.526.2338 or visit their website at www.ontheveranda.com. June 2 Concert on the Slopes The Magic of Sinatra performed by Paul Salos at the Sapphire Valley Resort. Show begins at 7 p.m. For more information, visit www.sapphirevalleyresort.com. June 2 & June 16 Highlands-Cashiers Plateau Audubon Societys Field Trip Around Highlands Bird and nature lovers are welcome to explore the Highlands area for native breeding birds. There is no charge to participate in the field trip that begins near Highlands Town Hall in the public parking area at 7:30 a.m. For more information, contact Brock Hutchins at 828.787.1387. June 4 Darwin & Dixie at The Nature Center at Highlands Biological Station the first in the June Zahner Conservation Lecture Series. Executive Director of the Station and Professor of Biology at Western Carolina University Jim Costa presents a lecture on Southeastern Natural History and its influence on Charles Darwin. Begins at 7 p.m. For more information, visit the website at www.wcu.edu/hbs or call 828.526.2602. June 4 Birding with the Audubon Eco Tour hosted by the Highlands-Cashiers Land Trust This moderate-level bird hike is free to HCLT members and just $25 donation for new friends. Reserve your spot by calling 828.526.1111. June 5 & 6 New Yorks Lynn Loosier performs at Highlands Martin-Lipscomb Performing Arts Center Dont miss this special two-night engagement of the artful performances of singer, Lynn Loosier. Described as a Saloon Singer by Backstage Magazine the talented Ms. Loosier can sing any style of music jazz, blues, R&B, country and rock. Show times begin at 7:30 p.m. For tickets, call 828.526.9047 or visit www.highlandsperformingartscenter.org. June 6 Celebrate Land Trust Day! Show your support for the Highlands-Cashiers Land Trust by shopping and dining at some of your favorite local merchants. A portion of the proceeds benefits HCLT. For a list of participating businesses, visit www.hicashlt.org or call 828.526.1111. June 6 Highlands Improvement Society Social hosted by the Highlands-Cashiers Land Trust Take a step back in time to learn what life was like on the Plateau in 1909 during this very special Centennial Event. Enjoy a picnic dinner, take part in a cakewalk, toss some horseshoes and dance to live music set against the backdrop of scenic Whiteside Cove Road. Terrific opportunity to learn more about the history of the land trust, its founding members and its first purchase of land the summit of Satulah Mountain. Period costumes are optional, but encouraged. Festivities begin at 6 p.m. Contact HCLT for reservations and ticket prices by calling 828.526.1111 or emailing Julie.hitrust@earthlink.net. June 6 Meet and Greet with the Cashiers-Highlands Humane Society will be held from 11 a.m. to 2 p.m. on the Cashiers Village Green. Consider taking one of these precious pets home with you! For more information, visit www.chhumanesociety.org. June 7 Where It All Began hosted by the Highlands-Cashiers Land Trust Enjoy high tea on the summit of Satulah Mountain the site of the Highlands Improvement Societys first land purchase one hundred years ago. Afternoon includes a skit by Highlands Historical Society president, Elaine Whitehurst and the music of bag piper, David Landis. Period costumes and kilts are optional, but encouraged. Event begins at 4:00 p.m. Contact HCLT for reservations and ticket prices by calling 828.526.1111 or emailing Julie.hitrust@earthlink.net. June 7 Highlands-Cashiers Chamber Music Festival at Wolfgangs Restaurant & Wine Bar This exciting kick-off fund-raising event for the 28th annual Highlands-Cashiers Chamber Music Festival features excellent Argentinean wines paired with Wolfgangs fine food along with the delightful music of the Mozart String Trio. A portion of wine sales and all ticket sales benefit the HCCMF. For more information, call 828.526-9060. June 8 7th Annual Special Operations Warrior Foundation Charity Golf Tournament at Burlingame Country Club Cost to participate is $100/person and includes lunch, dinner and chance to win door prizes. Prizes will be awarded to top three teams. Proceeds from the event go to support SOWF a very special organization created to provide college educations to the surviving children of fallen Army, Navy, Air Force and Marine Corps special operations forces who lose their lives in combat or training, and to provide immediate financial assistance for special operations forces who are severely wounded in action. For more information, call Butch Waller at BCC at 828.966.9200 or Bill Horwitz at 828.526.0224. June 8 Native Plant, Insect and Bird Connections presented by the Highlands Plateau Audubon Society Featuring Jim Costa, Executive Director of The Highlands Biological Station, the program is free to attendees and begins at 7:30 p.m. at The Highlands Civic Center. For more information, visit www.highlandsaudubonsociety.org. June 11 Nance Dude at the Highlands Performing Arts Center The story of mountain grandmother Nance Dude is portrayed in this one-woman show starring Elizabeth Westall. Performance begins at 7:30 p.m. and tickets are just $15 to purchase your tickets, call 828.526.9047. June 11 7th Annual Special Operations Warrior Foundation Silent & Live Auction Sponsored by Chef Nicholas Figel of The Cyprus Restaurant and hosted at The Highlands Community Center. Tickets with reservation are $25 - $30 at the door. Event includes catered buffet dinner featuring international fare, wine, beer, soda and great music, as well as silent and live auction to benefit SOWF a very special organization created to provide college educations to the surviving children of fallen Army, Navy, Air Force and Marine Corps special operations forces who lose their lives in combat or training, and to provide immediate financial assistance for special operations forces who are severely wounded in action. For more information, call 828.526.0224. June 11 Book Signing at the Bascom Author and master ceramic artist, Mark Hewitt, will be on hand to sign copies of his acclaimed book The Potters Eye: Art and Tradition in North Carolina from 5-7 p.m. For more information, call 828.526.4949 or visit www.thebascom.org/presentations. June 13 The Three Potters at the Bascom The works of artists Hewitt, Bringle and Stuempfle will be on exhibit through July 11. A public opening reception will be eld June 13 from 5-7 p.m. admission is free. An earlier demonstration from the artists themselves will be presented in the studio barn from 9 a.m. to noon tickets are $30 for Bascom members and $45 for general admission. For more information or to reserve your spot, call 828.526.4949 or visit www.thebascom.org. June 13 World Wide Knit In at the Bascom Bring a lawn chair and your yarn, and join us on the terrace of the Bascom for this free event and beautiful mountain views from 2-4 p.m. For more information, call 828.526.4949 or visit www.thebascom.org. June 13 7th Annual Special Operations Adventure Race (SOAR) features 2 separate races including running, rappelling, orienteering, water event and mountain biking: the Sprint Race 5-7 hours and the Elite Race 10-12hours. The Elite Race begins at 7 a.m. and the Sprint Race begins at 8 a.m. Proceeds benefit the Special Operations Warrior Foundation a very special organization created to provide college educations to the surviving children of fallen Army, Navy, Air Force and Marine Corps special operations forces who lose their lives in combat or training, and to provide immediate financial assistance for special operations forces who are severely wounded in action. For more information or to register, call 828.526.0224 or visit www.soarhighlands.org. June 13 John Collette Fine Art Benefit for Highlands-Cashier Chamber Music Festival Located on Main Street in Highlands, John Collette Fine Art will host an evening of fine art, open bar, hors doeuvres and artist raffles to benefit HCCMF. Event runs from 5:30 to 7:30 p.m. For more information, call 828.526.9060. June 13-14 Cashiers Valley Rotary Spring Fling Join us on Cashiers Village Green from 10 a.m. to 2 p.m. for arts, crafts, food and FUN! Pets from Cashiers-Highlands Humane Society will be on hand to love and adopt. For more information, visit www.cashiersrotary.org. June 18 & 24 "100 Years of Land Conservation" - Ran Shaffner, Dr. Gary Wein and Rosemary Clark share the history of the Highlands-Cashier Land Trust and its vision for the future in honor of the centennial celebration of this special organization. New logo will be unveiled. First presentation takes place at The Highlands Biological Station's Nature Center on June 18 at 7 p.m. and the second presentation is scheduled for June 24 at 6:30 p.m. at Jennings Barn at Lonesome Valley. Free to all! For more information, call 828.526.1111. June 18-July 5 The Taffetas at Highlands Playhouse Delightful musical that pays homage to the girl groups of the 1950s tells the story of four singing sisters from Muncie, Indiana who are making their national television singing debut. Tickets are $30. For show times and information about ticket purchases, call 828.526.2695 or visit www.highlandsplayhouse.org. June 20 Traditional Appalachian and Cherokee Legends at the Highlands Martin-Lipscomb Performing Arts Center Storytellers Marilyn McMinn-McCredie and Lloyd Arneach weave tales in a style that is humorous, informative and extremely moving. Performance begins at 7:30 p.m. Tickets are $15 and available for purchase at www.highlandsperformingartscenter.org. June 25 Highlands Innkeepers Tour 11 a.m. to 6 p.m. More details to follow! June 26-28 Walk in the Park with the Highlands Historical Society Features portrayals of past Highlands leaders, the formation of the Highlands Improvement Society and the founding of the Highlands-Cashiers Land Trust. Tickets are $15 students admitted free. June 26 and 27 6-7:30 p.m. Highlands Memorial Cemetery (shuttle from Recreation Park); June 28 4 p.m. Performing Arts Center on Chestnut Street. For more information, visit www.highlandshistory.com. June 27-28 Sapphire Valley Master Association Arts & Crafts Festival 10 a.m. to 2 p.m. on the Sapphire Valley Athletic Field. Contemporary crafts, folk art, jewelry and more. Animals from the Cashiers-Highlands Humane Society will be on hand to love and adopt. For more information, call 828.743.0321. With a history dating back to 1895, Lonesome Valley has served as a bastion to the great outdoors ever since Pittsburg entrepreneur and visionary E.H. Jennings first acquired 35,000 acres near the sleepy village of Cashiers. While Mr. Jennings is responsible for developing one of Western North Carolinas most popular resort destinations, he chose to preserve Lonesome Valley as a special place to share with his friends and family. Gracefully spanning the valley floor of the largest box canyon east of the Rockies, Lonesome Valley is said by many to be the place where Heaven and Earth meet. For more than a century, the Jennings family has continued to take great care to maintain the history and natural beauty of this unique mountain treasure. Carefully developed in accordance with the Jennings familys wishes, amenities and homes within this stunning community complement the natural beauty of the area. Lonesome Valley has quickly become one of Cashiers most sought after developments. Cottage and home designs pay homage to the Southern Appalachian farmhouses of a bygone era. Dining within the community highlights Southern cuisine made with fresh produce grown in the Valley. The Canyon Kitchen is currently open for the season on Thursdays through Sundays, and features the culinary talents of Chef John Fleer (formerly of the renowned Blackberry Farm in Tennessee). The Canyon Kitchen is located inside Jennings Barn at the heart of the Lonesome Valley community, and reservations are recommended. Silver Creek Real Estate Group is proud to announce that we are now highlighting several incredible homes and amazing lots available for purchase in Lonesome Valley on our website. A handful of new-construction cabins, cottages and homes are available for immediate move-in, or select your own view from a series of incredible home sites currently being offered. For photo tours and more information on Lonesome Valley in Cashiers, North Carolina, click on the following two links: Lonesome Valley land or homes for sale. When youre ready to buy or build the home of your dreams, contact one of the talented brokers at Silver Creek by calling us at (828) 742-1999, dropping by our offices located just west of the Cashiers Crossroads in The Shoppes at CreekSide, or by filling out our online contact form . We look forward to meeting you and introducing you to one of Cashiers most visually stunning communities.